Living a Fit and Full Life: Get Ready for the Beach with Sally Hansen Color Therapy Nail Polish & Airbrush Legs! Get Ready for the Beach with Sally Hansen Color Therapy Nail Polish & Airbrush Legs! Complete your manicure with Color Therapy top coat, formulated with breakthrough argan oil formula. Get luminous, high shine finish while extending your manicure. Get ready for the beach with Sally Hansen Color Therapy Nail Polish and Airbrush Legs! While I won't be hitting the beach this summer, I will be hitting the pool quite a bit. One thing I hate during the summer is how white my legs are. Normally it doesn't bother me, but when I have to put on a bathing suite my legs make me stand out because they're so incredibly white. I've tried tanning but I just don't seem to tan well. Sally Hansen's Airbrush Legs are the perfect fix for me! Sally Hansen's Airbrush Legs blends in extremely well, covers all my veins and imperfections and stays on extremely well. It's water and transfer resistant so not only does it stay on when it gets wet, but it doesn't transfer to your towel or anything else. 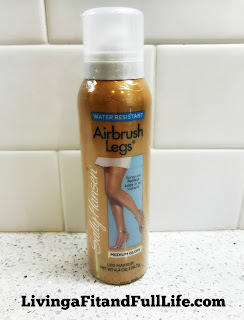 Sally Hansen's Airbrush Legs are an easy fix to get your legs ready for summer! Sally Hansen's Color Therapy Nail Polish are the perfect way to get your toes ready for summer! 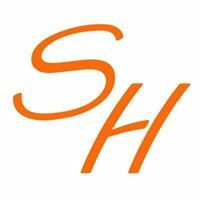 With sandal season in full effect I've been on the hunt for the perfect nail polish to pretty up my toes. 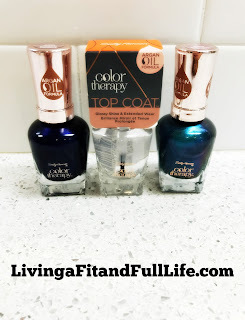 Sally Hansen's Color Therapy Nail Polish is not only fade-proof and chip-resistant for up to 10 days, but it seems to help my natural nails both look and feel healthier. The argan oil formula definitely seems to do as promised. Sally Hansen's Color Therapy Nail Polish is available in 38 stunning shades so there's sure to be a shade that's just right for you! Sally Hansen Color Therapy Nail Polish and Airbrush Legs are just what you need this summer to look your best!